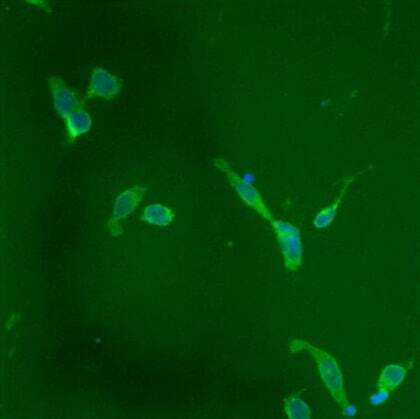 Mouse monoclonal P4HB antibody [RL90]. Validated in WB, IP, ELISA, IHC, Flow Cyt, Inhibition, EM, ICC/IF and tested in Mouse, Rat, Hamster, Dog, Human, Pig, Monkey, African green monkey. Other Immunogen Type corresponding to Rat P4HB. Purified rat PDIA1/P4HB protein. Our Abpromise guarantee covers the use of ab2792 in the following tested applications. IP Use at an assay dependent concentration. 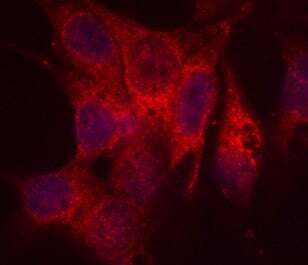 This antibody has been shown to inhibit the activity of PDI in vitro. It has also been found to inhibit disulfide bond reduction of the HIV protein, gp120, at the cell surface of CHO cells and human lymphoid cells. WB 1/1000. Detects a band of approximately 59-61 kDa (predicted molecular weight: 58 kDa). If there is no signal or signal is weak, more concentrated antibody could be used in addition to using less stringent blocking conditions (e.g., BSA instead of milk, incubating the antibody in PBST or TBST only, lower milk percentage). Western blot analysis of P4HB (PDIA1) was performed by loading 25 ug of HepG2 (Lane 1) Hela (Lane 2) and NIH-3T3 (Lane 3) cell lysates onto an SDS polyacrylamide gel. Proteins were transferred to a PVDF membrane and blocked at 4?C overnight. The membrane was probed with ab2792 at 1:1000 overnight at 4?C and washed in TBST. The membrane was then probed with a HRP-conjugated secondary antibody for 1 hr at room temperature in the dark. Chemiluminescent detection was performed using a ECL Plus Western Blotting Substrate. Results show a band at approx. 57 kDa. 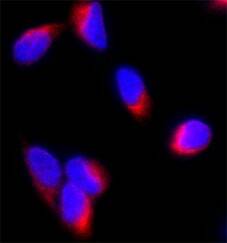 Immunocytochemistry/Immunofluorescence analysis of P4HB (PDIA1) (red) in U2OS cells. Formalin fixed cells were permeabilized with 0.1% Triton X-100 in PBS for 10 minutes at room temperature and blocked with 2% BSA in PBS + 0.1% Triton X-100 for 30 minutes at room temperature. Cells were probed with ab2792 (1:75) for at least 1 hour at room temperature and incubated with DyLight 550 goat anti-mouse IgG secondary antibody (1:250) for 30 minutes at room temperature. Actin was stained with DyLight 488 Phalloidin at a dilution of 1:300 (1 unit/ml final concentration) for 30 minutes. Images were taken at 20X magnification. Immunohistochemistry was performed on both normal and cancer biopsies of deparaffinized Human colon tissue tissues. To expose target proteins heat induced antigen retrieval was performed using 10mM sodium citrate (pH6.0) buffer microwaved for 8-15 minutes. Following antigen retrieval tissues were blocked in 3% BSA-PBS for 30 minutes at room temperature. Tissues were then probed at a dilution of 1:200 with a mouse monoclonal antibody recognizing P4HB (PDIA1) ab2792 or without primary antibody (negative control) overnight at 4°C in a humidified chamber. Tissues were washed extensively with PBST and endogenous peroxidase activity was quenched with a peroxidase suppressor. Detection was performed using a biotin-conjugated secondary antibody and SA-HRP followed by colorimetric detection using DAB. Tissues were counterstained with hematoxylin and prepped for mounting. Overlay histogram showing HeLa cells stained with ab2792 (red line). The cells were fixed with 80% methanol (5 min) and then permeabilized with 0.1% PBS-Tween for 20 min. The cells were then incubated in 1x PBS / 10% normal goat serum / 0.3M glycine to block non-specific protein-protein interactions followed by the antibody (ab2792, 0.5µg/1x106 cells) for 30 min at 22ºC. The secondary antibody used was DyLight® 488 goat anti-mouse IgG (H+L) (ab96879) at 1/500 dilution for 30 min at 22ºC. Isotype control antibody (black line) was mouse IgG2a [ICIGG2A] (ab91361, 1µg/1x106 cells) used under the same conditions. Acquisition of >5,000 events was performed. Observed band size: 57 kDa why is the actual band size different from the predicted? Blocked with 5% milk for 1 hour at 22°C. Incubated with the primary for 16 hours at 4°C in PBS + 2.5% milk + 0.05% Tween20. 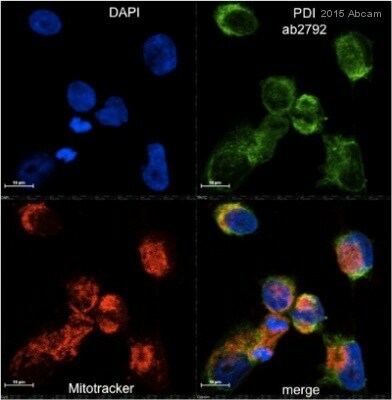 ab2792 staining P4HB (PDIA1) in MDA MB 231 cells by ICC/IF (Immunocytochemistry/immunofluorescence). Cells were fixed with formaldehyde, permeabilized with 1% Triton X-100 and blocked with 10% BSA for 1 hour at 21°C. Samples were incubated with primary antibody (1/100 in BSA + 0.02% Tween 20) for 1 hour at 16°C. 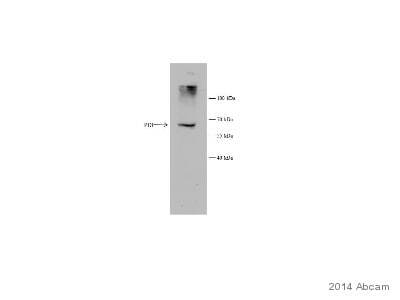 A DyLight® 550-conjugated goat anti-mouse IgG polyclonal (1/500) was used as the secondary antibody. 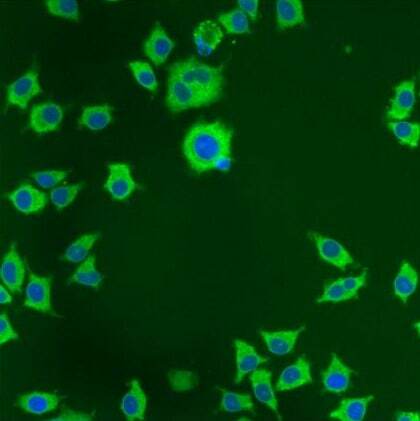 Immunocytochemistry/Immunofluorescence analysis of P4HB (PDIA1) (green) in NIH 3T3 cells. Formalin fixed cells were permeabilized with 0.1% Triton X-100 in PBS for 10 minutes at room temperature and blocked with 2% BSA in PBS + 0.1% Triton X-100 for 30 minutes at room temperature. 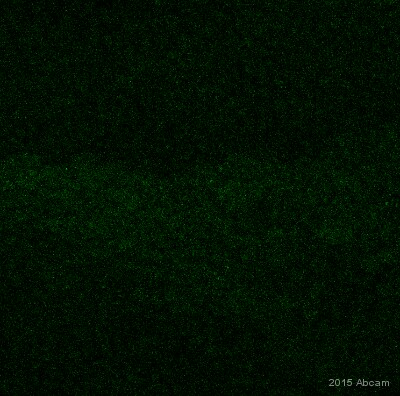 Cells were probed with ab2792 (1:75) for at least 1 hour at room temperature and incubated with Dylight 488 goat anti-mouse IgG secondary antibody (1:250) for 30 minutes at room temperature. 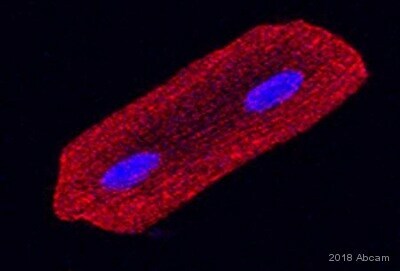 Actin was stained with Dylight 350 Phalloidin at a dilution of 1:120 (2.5units/ml final concentration) and nuclei (red) were stained with DRAQ5 at a concentration of 1ug/ml for 30 minutes. Images were taken at 20X magnification. Immunocytochemistry/Immunofluorescence analysis of P4HB (PDIA1) (green) in NIH 3T3 cells. Formalin fixed cells were permeabilized with 0.1% Triton X-100 in PBS for 10 minutes at room temperature and blocked with 2% BSA in PBS + 0.1% Triton X-100 for 30 minutes at room temperature. Cells were incubated with ab2792 (1:75) for at least 1 hour at room temperature and incubated with DyLight 488 goat anti-mouse IgG secondary antibody (1:250) for 30 minutes at room temperature. Actin was stained with DyLight 550 Phalloidin at a dilution of 1:120 (2.5 units/ml final concentration) and nuclei (blue) were stained with Hoechst at a concentration of 1ug/ml for 30 minutes. Images were taken at 20X magnification. 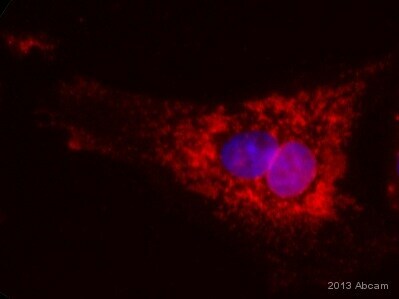 Immunocytochemistry/Immunofluorescence analysis of P4HB (PDIA1) (green) in NIH 3T3 cells. Formalin fixed cells were permeabilized with 0.1% Triton X-100 in PBS for 10 minutes at room temperature and blocked with 2% BSA in PBS + 0.1% Triton X-100 for 30 minutes at room temperature. Cells were incubated with ab2792 (1:75) for at least 1 hour at room temperature and incubated with DyLight 488 goat anti-mouse IgG secondary antibody (1:250) for 30 minutes at room temperature. Actin was stained with DyLight 650 Phalloidin at a dilution of 1:120 (2.5 units/ml final concentration) and nuclei (blue) were stained with Hoechst at a concentration of 1ug/ml for 30 minutes. Images were taken at 20X magnification. 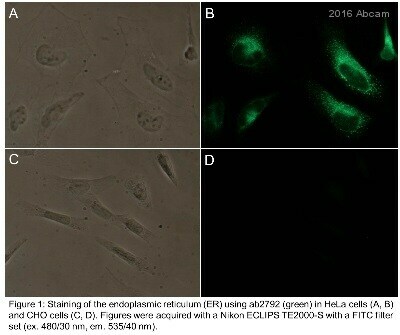 Immunocytochemistry/Immunofluorescent analysis of P4HB (PDIA1) using ab2792 shows staining in p19 Cells. Immunocytochemistry/Immunofluorescent analysis of P4HB (PDIA1) using ab2792 shows staining in NS-1 Cells. Immunocytochemistry/Immunofluorescent analysis of P4HB (PDIA1) using ab2792 shows staining in HMVEC Cells. Immunocytochemistry/Immunofluorescent analysis of P4HB (PDIA1) using ab2792 shows staining in A549 Cells. This image is courtesy of an Abreview submitted by Kun Liu on 20 September 2005. We do not have any further information relating to this image. 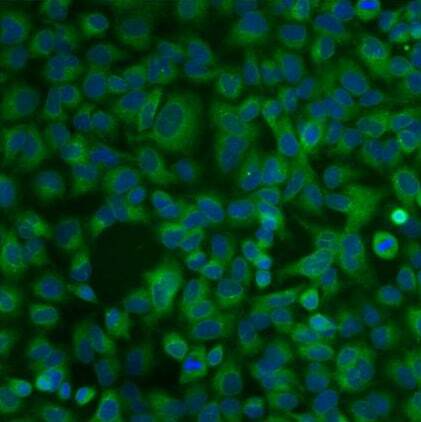 ab2792 positively staining formaldehyde fixed human Hek293 cells (1/200). 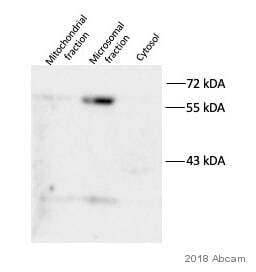 This Ab was used in conjunction with goat anti mouse Alexa Fluor® 546 (1/1500). The nuclei has been atained with Hoechst. This image is courtesy of an Abreview submitted by Kun Liu on 19th September 2005. We do not have any further information relating to this image. ab2792 staining P4HB (PDIA1) from human HaCaT keratinocyte cells by Immunocytochemistry/ Immunofluorescence. Cells were fixed with paraformaldehyde, permeabilized with 0.25 % Triton ×100 and blocking with 2.5% BSA plus 1% goat serum for 1 hour at 4°C was performed. Samples were incubated with primary antibody, diluted 1/100, for 1 hour at 240C. An Alexa Fluor® 488-conjugated goat polyclonal to mouse IgG was used at dilution at 1/1000 as secondary antibody. Immunohistochemistry was performed on both normal and cancer biopsies of deparaffinized Human tonsil tissue tissues. To expose target proteins heat induced antigen retrieval was performed using 10mM sodium citrate (pH6.0) buffer microwaved for 8-15 minutes. Following antigen retrieval tissues were blocked in 3% BSA-PBS for 30 minutes at room temperature. Tissues were then probed at a dilution of 1:200 with a mouse monoclonal antibody recognizing P4HB (PDIA1) ab2792 or without primary antibody (negative control) overnight at 4°C in a humidified chamber. Tissues were washed extensively with PBST and endogenous peroxidase activity was quenched with a peroxidase suppressor. Detection was performed using a biotin-conjugated secondary antibody and SA-HRP followed by colorimetric detection using DAB. Tissues were counterstained with hematoxylin and prepped for mounting. Immunohistochemistry was performed on both normal and cancer biopsies of deparaffinized Human lung adenocarcinoma tissues. To expose target proteins heat induced antigen retrieval was performed using 10mM sodium citrate (pH6.0) buffer microwaved for 8-15 minutes. Following antigen retrieval tissues were blocked in 3% BSA-PBS for 30 minutes at room temperature. Tissues were then probed at a dilution of 1:200 with a mouse monoclonal antibody recognizing P4HB (PDIA1) ab2792 or without primary antibody (negative control) overnight at 4°C in a humidified chamber. Tissues were washed extensively with PBST and endogenous peroxidase activity was quenched with a peroxidase suppressor. Detection was performed using a biotin-conjugated secondary antibody and SA-HRP followed by colorimetric detection using DAB. Tissues were counterstained with hematoxylin and prepped for mounting. Flow cytometry analysis of P4HB (PDIA1) showing positive staining in the membrane and cytoplasm of K562 cells compared to an isotype control (blue). Cells were harvested and adjusted to a concentration of 1-5x10^6 cells/ml. Cells were then fixed with 2% paraformaldehyde and washed with PBS. Cells were blocked with a 2% solution of BSA-PBS for 30 min at room temperature and incubated with ab2792 at 1 ug/test for 60 min at room temperature. Cells were then incubated for 40 min at room temperature in the dark using a Dylight 488-conjugated goat anti-mouse IgG (H+L) secondary antibody and re-suspended in PBS for FACS analysis. Flow cytometry analysis of P4HB (PDIA1) showing positive staining in the membrane and cytoplasm of NIH/3T3 cells compared to an isotype control (blue). Cells were harvested and adjusted to a concentration of 1-5x10^6 cells/ml. Cells were then fixed with 2% paraformaldehyde and washed with PBS. Cells were blocked with a 2% solution of BSA-PBS for 30 min at room temperature and incubated with ab2792 at 0.5 ug/test for 60 min at room temperature. Cells were then incubated for 40 min at room temperature in the dark using a Dylight 488-conjugated goat anti-mouse IgG (H+L) secondary antibody and re-suspended in PBS for FACS analysis. Flow cytometry analysis of P4HB (PDIA1) showing positive staining in the membrane and cytoplasm of Hela cells compared to an isotype control (blue). Cells were harvested and adjusted to a concentration of 1-5x10^6 cells/ml. Cells were then fixed with 2% paraformaldehyde and washed with PBS. Cells were blocked with a 2% solution of BSA-PBS for 30 min at room temperature and incubated with ab2792 at 1 ug/test for 60 min at room temperature. 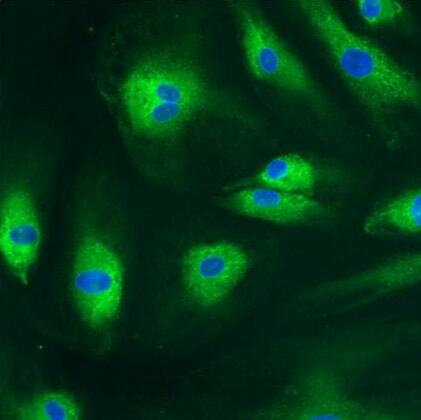 Cells were then incubated for 40 min at room temperature in the dark using a Dylight 488-conjugated goat anti-mouse IgG (H+L) secondary antibody and re-suspended in PBS for FACS analysis. Publishing research using ab2792? Please let us know so that we can cite the reference in this datasheet.